On my last day of vacation in England in August, it rained. The friend I was visiting had a morning appointment, and so I found myself dodging raindrops in dowtown Oxford, visiting museums rather than gardens. I left my D300 at home but packed along my trusty Canon G11. 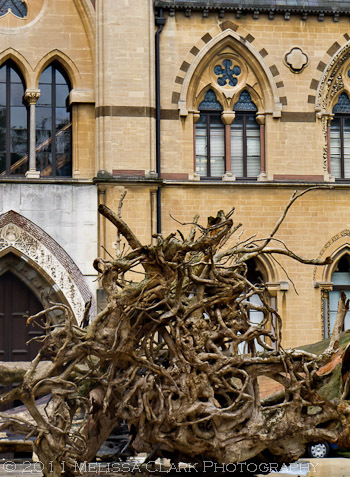 Sure enough, I found plenty to shoot, starting with “Ghost Forest,” a remarkable installation at the Oxford Museum of Natural History and Pitt Rivers Museum. 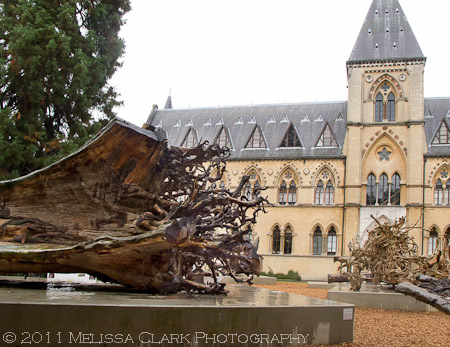 The outdoor installation of enormous tree roots called "Ghost Forest" outside the Oxford Museum of Natural History. On the left is a denya tree, the largest specimen in the installation. The artist, Angela Palmer, sourced the tree stumps on display from fallen rainforest trees in Ghana, which have been decimated by illegal logging over the years (Ghana, which supports the artwork on display, became the first African country to sign an agreement with the EU outlawing trade in illegally felled timber, according to the British newspaper The Guardian.) Palmer has put on display ten tree stumps from commercially logged areas in the Suhuma rainforest areas of western Ghana. Three were trees that had been felled, and seven had toppled over during storms. I couldn’t decide which was more impressive – their size, or their beauty. But why choose? The massive tangled roots of one of the trees from Ghana. The installation has also appeared in Trafalgar Square and in Copenhagen for the U.N. Climate Conference. When I visited in Oxford, signage indicated the installation was about to close, but its run there has apparently recently been extended through July 2012. For more information and extensive photos documenting this project, visit the Ghost Forest website or archived photos from The Guardian.